Villa The Sanctuary Bali is a private and exclusive villa-resort only minutes away from the beach. Villa The Sanctuary Bali is famous for five star service: Villa The Sanctuary Bali has 27 professional staff to look after guests. 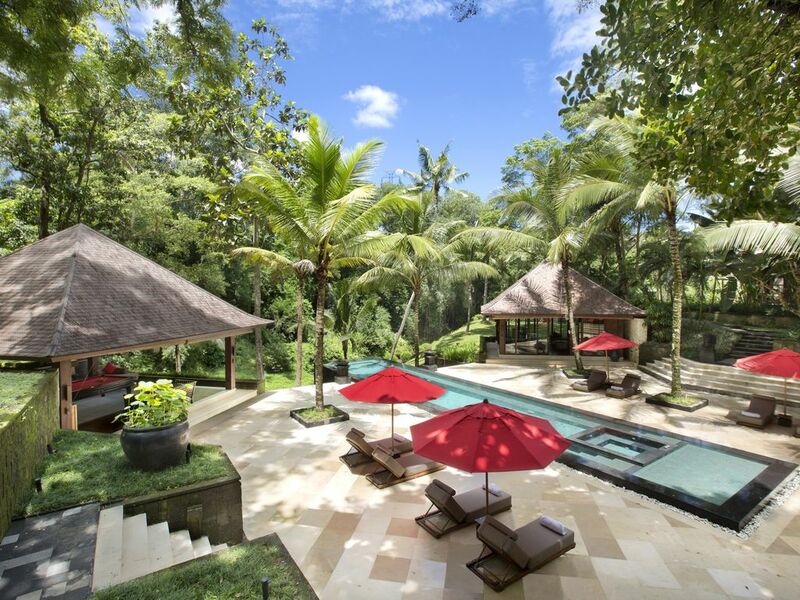 Villa The Sanctuary Bali specialises to accommodate large groups, friends reunions, family holidays, corporate retreats, yoga retreats, birthday parties, weddings and events. • 1 bunk house with 2 bunk bedrooms housing 5 bunk beds each to accommodate maximum 20 children. This bunk house can be converted into 2 luxury bedrooms with a double bed or twin bed. Villa The Sanctuary Bali has a professional and fully equipped kitchen connected to the central dining and living pavilion overlooking an amazing 35 meter infinity pool with unobstructed jungle and river views. Villa The Sanctuary Bali takes great pride in the amazing quality of their food. Along this 35 meter infinity pool you find two wooden Bales with library, media room, cinema TV system, lounging chairs, bar, billiards table, DJ System and games. In the pool Villa The Sanctuary Bali has a build in Jacuzzi and Kids Pool. Villa The Sanctuary Bali also has spa and gym. The expansive green lawns offer a very large playground for kids and are perfect for weddings and events. Villa The Sanctuary Bali makes all your dreams come true in this 20.000 m2 piece of paradise. Passionate about Villa The Sanctuary Bali. Magical luxury property with stunning views and mystical aura. Stunning property with breathtaking views along a river in the middle of the jungle still very close to the beach and all the hotspots in Bali. Private Resort Villa: Villa The Sanctuary Bali has a luxury resort feel spread out over 20.000 m2 land. Villa The Sanctuary Bali is ideal for large groups, family holidays, weddings and events. Villa The Sanctuary Bali is tucked away behind a rural village which makes part of Canggu which is the high end living area of Bali. The beach and Indian Ocean is 5 km away. Villa The Sanctuary Bali sits on 20.000 m2 land behind a rural village in Canggu. River front: Villa The Sanctuary Bali is build along a river amidst Bali's nature and has amazing water views and jungle views from every corner in this massive property. All bedrooms come with airconditioning. Fresh linen included + room cleaning twice daily. We gave a private and secured parking for 15 vehicles. Free WIFI spread out over our villa. Daily fresh towels in the bedrooms and around the pool. Do you feel to work out? Please use our gym and energize your mind! We have a small gym with weight and basic equipment. The living room is also located in our spacious open-air main pavilion: situated next to the dining room, it has an enormous lounging sofa and fantastic Indonesian art. We have 2 professional refrigerators and freezers. Professional Espresso Machine. Free coffee all day. Professionally equipped kitchen with professional kitchen team and two professional chef cooks. Our dining room is located in the main pavilion. This sheltered and spacious open-air pavilion offers stunning green infinity views over Bali’s beauty. We have a special access road for wheelchair users around the villa: our staff will take great care of you. Five star service and facilities! We hosted our wedding in Villa The Sanctuary Bali and stayed with our immediate family 7 for nights on this beautiful property. Villa The Sanctuary Bali is breathtaking, the pictures do not do it justice. It is truly a stunning property. The views and facilities are of the best that any of our guests, who travel frequently, have visited. Villa The Sanctuary Bali is a five star luxury villa with extremely professional staff that caters to your needs as a group. We cannot complement the staff enough. They had a clear motive, which was to enhance guest experience. Especially Putu and Salam went out of their way. If you are looking for luxury, top notch meals (the chefs are just the best you can imagine), beautiful beaches (about a 5-10 minute car ride) with world class accommodations - look no further than Villa The Sanctuary Bali. -the views are amazing as is the architecture of this villa. It has taken a lot of courage to develop such a beautiful property tucked away in a local Balinese village. We will come back for many years to come! -the aura of the villa is priceless and the name of the villa does it justice. We loved it here! -the rooms were very large and comfortable. -we especially loved the pool and Jacuzzi. -the drivers brought the youngsters in and out Seminyak safe when they wanted to party so we didn’t had to worry at night..
-the food was impeccably prepared and fresh: every day. -the location is perfect: I think it is almost impossible to find a villa in Bali with so much space and privacy. Seminyak is not far and the beach is less than 10 minutes away. We booked our wedding with a wedding planner recommended by Villa The Sanctuary Bali and we can only congratulate them of making our event so perfectly organized. It was beautiful and perfect. Thank you so much! warm regards from Villa The Sanctuary Bali. It is great to read your review. Thank you to take the time to share your experience online. We are a group of expats from Kuala Lumpur and we stayed 5 nights in Villa The Sanctuary Bali with our wives and respective families . It was the best holiday choice I think we ever made. The villa is off the chart and we all looked in amazement when we arrived – its draw dropping gorgeous. The kids absolutely loved the bunk rooms that sleep up to 20. There was enough room that although we were effectively 5 families, there was plenty of space for the children to play, but also for you to relax on your own in privacy when we wanted. I guess that is what made this villa for me personally. The villa isn't a singular villa, its like a whole resort set in huge grounds with individual private villas for each couple/family to stay in, then you congregate in the stunning common areas when you want to. Some of us just stayed in the villa all day to unwind and some of us who were a bit more energetic went surfing in Pererenan (next to Ecko Beach) or golfing in Tanah Lot (the most stunning course Ive ever played at) which are both a 5 and 10 minutes drive from the villa. The ladies went shopping in Seminyak and both the drivers Marcel and Nyoman were amazing. They brought anyone anywhere anytime. I congratulate Ketut, the villa manager, for his very professional attitude and approach. It must not be easy to manage such a big place. Villa The Sanctuary Bali is hidden away in a charming Balinese village that is part of Canggu which is considered the high end living area of Bali. Canggu Beach, Batu Bolong Beach, Echo Beach, Pererenan Beach and Seseh Beach are all a 5 minutes scenic drive from Villa The Sanctuary Bali. Villa The Sanctuary Bali has a perfect location along a river amidst a rainforest offering total privacy and amazing views on more than 20.000 m2 land. A swim in our pool, a game of billiards along our pool, an hour in our gym, a massage in our spa, a surf at the beach, a magical bike ride in the rural village and amongst the rice fields or a game of golf in Nirwana Golf Course are all a matter of steps away! If you are looking for a young and trendy lifestyle with bars, restaurants and hipsters you will find this in Jalan Batu Bolong and Echo Beach which is a 5 minutes drive from Villa The Sanctuary Bali. Villa The Sanctuary Bali is also close to Bali's most wanted area "Seminyak" with its modern shops, chic boutiques, world-class restaurants, vibrant bars and funky beach clubs. Our driver brings you to venues such as Ku De Ta, Sardines, Metis, Sarong, Potato Head, W resort and La Lucciola in less than 25 minutes. For our guests who like to explore we organise excursions to Ubud which is one of Bali's major arts and culture centres. Our driver brings you there within 45 minutes.